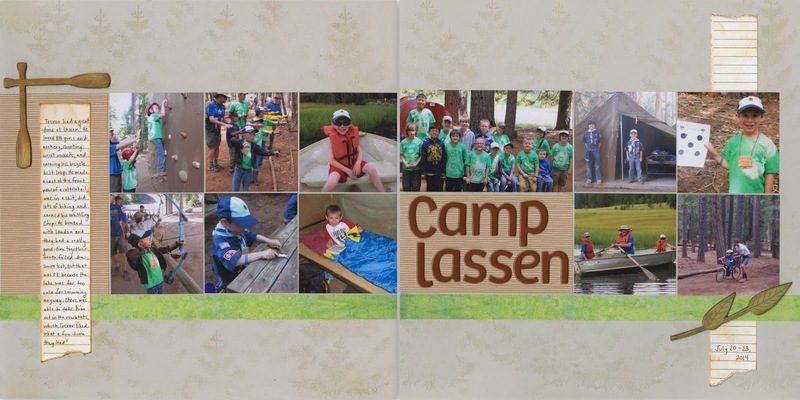 Trevor made his first scrapbook as a Tiger Cub requirement in October 2012. Despite how much he loved making it and how proud he is of it, he hadn't expressed an interest in scrapbooking since then... until last Sunday at 6:00 am. He was so incredibly proud of it. He explained that he chose the two papers because the dots reminded him of Easter eggs. 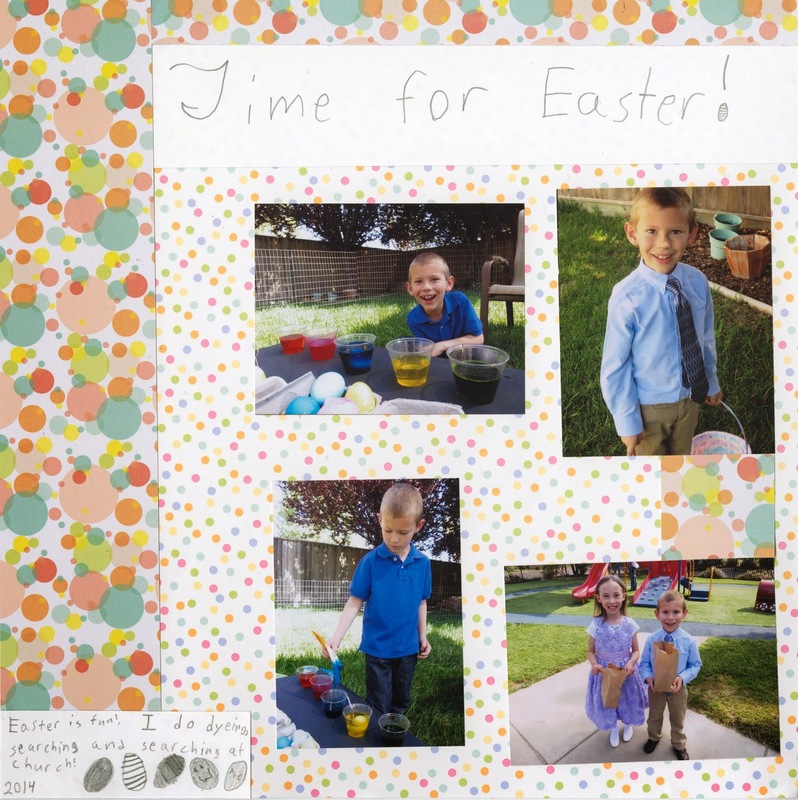 He chose the four pictures because two are of him dyeing eggs and two are of him hunting for eggs. He did his journaling on white so that it would be easy to read and in pencil in case he made a mistake and wanted to erase (which he did not). He asked if I was going to put it in my album. I said that would be fine, or he could have his own album to put pages in if he's planning to make more. He said an enthusiastic, "YES! ", so he now has his own album to house his pages. Hopefully I'll have more of his pages to share in the near future. 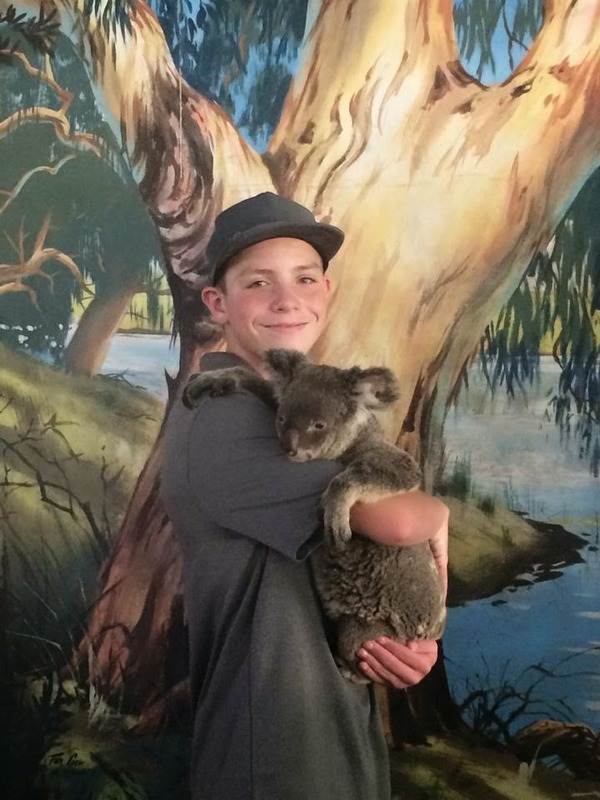 My nephew Timothy recently returned from his Make-a-Wish trip to Australia. They had a fantastic time. I loved reading the updates, seeing the photos, and hearing all about it. Here's Timothy, holding a koala. The real-life koala inspired these styrofoam koalas. Paint the styrofoam balls grey. The easiest way is by pouncing the paint onto the surface of the styrofoam rather than trying to brush it on. I chose to poke a dowel into each ball so that I could paint them in one sitting instead of doing one side and then the other. While the paint is drying, cut out grey ears and black noses and mouths. I laid the pieces out to check that I liked the proportions. Once I was happy with the size of the ears, noses, and mouths, I rounded the inside edge of the ear pieces to match the curve of the styrofoam ball. Here you can see the difference between the rough shape (left) and the one I rounded (right). Use strong craft glue to attach each of the facial features to the styrofoam ball, saving the ears for last. They will slump under their own weight if you don't hold them in place for a few minutes. After holding them for 2 or 3 minutes, the ears should stick without slumping. Allow them to dry completely without touching them. When the koalas are dry, you can use them to decorate a favorite framed photo, like I did. They also make really fun pencil toppers. If you used a dowel while painting them, there is already a perfectly-size hole in the perfect place! Do you know what decoden is? One of the Make-and-Takes I did at CHA was called a Decoden Cupcake (scroll down to the bottom of the linked post to see it). It turned out to be my absolute favorite of the many, many Make-and-Takes I did. But it wasn't until I came home and looked up the word decoden that I learned why the cupcake project was called what it was. Unless you are literally reading my blog for the very first time, you know that I'm not a more-is-more crafter. My style is extremely clean and simple with very little embellishing. Which is why it surprised me to learn just how much I like to do decoden! Materials: FloraCraft Styrofoam Ball, dowel, Snow-Tex, craft stick, assorted sequins, extra-fine glitter, paint, Oly*Fun, and Aleene's Tacky Glue. Begin by poking a hole in the styrofoam ball with the dowel. Then poke the other end of the dowel into a spare chunk of styrofoam so that it is supported upright. This will make it possible to apply sequins to all sides of the ball without making a giant mess. Use the craft stick to apply Snow-Tex to the surface of the styrofoam ball. Stick assorted sequins into the Snow-Tex so that they are firmly attached, but not buried. Try not to leave large gaps between sequins. As soon as the ball is covered in sequins, sprinkle it with extra-fine glitter. The glitter will stick to the still-moist Snow-Tex. Let the Snow-Tex dry completely (I left it overnight). When it is completely dry, gently blow off any extra glitter and remove the dowel from the ball. Paint the dowel pink. While it is drying, cut strips of Oly*Fun that are slightly longer than the dowel. I clipped them together with the amazingly-awesome Wonder Clips by Clover, which were also in the swag box. I don't sew, but I still have found a zillion uses for them in the 6 weeks I've had them. Put a generous amount of tacky glue in the hole at the bottom of the styrofoam ball. Remove the Wonder Clip and push the dowel and the Oly*Fun strips into the hole together. Poke the other end of the dowel back into the scrap styrofoam until it is dry. Then it's ready for the special princess in your life. Here's the final version of the ombre tie-dye shirt Trevor and I made using the Tulip Mini Tie Dye Kit. After setting the dye following the manufacturer's guidelines, we washed and dried the shirt. Then we played with a few ideas of how to embellish the shirt before settling on what you see. The large heart on the pocket is cut from Oly*Fun (one of the other awesome materials I received at the FaveCrafts Blogger Event) and hand-stitched in place with a simple running stitch. We added a pink button on top of that and a trio of heart buttons along the hem on the opposite side. So easy! It was a birthday gift for my niece, Allison. She liked it. Trevor was thrilled. What do you think? It's the first of four items that I made (so far) using items donated by the sponsors of the FaveCrafts Blogger Event. More tomorrow! Trevor came home from school the other day with an unusual square lump in his backpack. He'd brought home an empty Kleenex box and he couldn't wait to show it to me. "Mommy! I used the last Kleenex at school and decided to bring the box home instead of recycling it! I have a GREAT idea for a project!" He squirreled it away until he had collected two more, then announced it was time for me to learn how to make his projects (by then he had two ideas). Select the Kleenex box with the color and pattern that best resembles a bunny. Draw eyes, nose, whiskers and mouth using Sharpies. Open up a different Kleenex box and use it to cut two long ovals to make the bunny's ears. Fold each ear about one inch from the end to create a flat surface to attach it to the main box. Next, take a clean tissue and wad it up to make the bunny's tail. Use a loop of scotch tape to attach it. Select a Kleenex box and draw eyes on it. Use the scraps from the bunny's ears to cut a triangular beak. Fold it in half and tape it in place. Then cut out two matching wings and a topknot for the quail. Tape them in place. Done! I love it when Trevor teaches me how to do a craft. Disclosure: I was given the Twisteezwires I used. They were so easy to make! Except the grapes. Those were tricky and I'm not totally happy with them. I tried making a 2D version like the rest of the fruits and it looked too sparse. When I made a 3D set of grapes, they looked ok in real life, but photographed kind of wonky. I'm thinking of adding tissue paper or vellum to each grape, much like I added wax paper to Dot the Ladybug. Everyone who attended the Fave Crafts Blogger Event at CHA received a huge box of products from the sponsors. It was loaded with all sorts of awesome stuff. One of the first items that caught my eye (and Trevor's) was this Mini Tie-Dye Kit. I'd never seen it before, and I absolutely love the concept. The bottles contain dye in a powdered form. You just add water up to the fill line, shake, and then squirt the dye right where you want it. Here you can see what the bottle looks like before adding water. That small amount of powder at the bottom is very concentrated. I did a simple two-tone with the canvas bag. I put yellow in the upper right and red in the lower left and let them bleed together. Trevor wanted to try the ombre design on the toddler t-shirt. He saturated the bottom of the shirt with red dye, then used a dry, stiff-bristled paint brush to drag the color upward. He dipped the brush in water and dragged again. Neat! Trevor has already worn his t-shirt as is, but we have plans for the other two dyed items. I'll share those when they're done. I highly recommend the Tulip Mini Tie-Dye Kit. It was easy to use and delivered brilliant color. It couldn't have been easier to use and it was much easier to clean up than the typical dye bath. The colors faded a little bit with washing, but not much. As promised, there was enough dye for three projects. Two thumbs up! 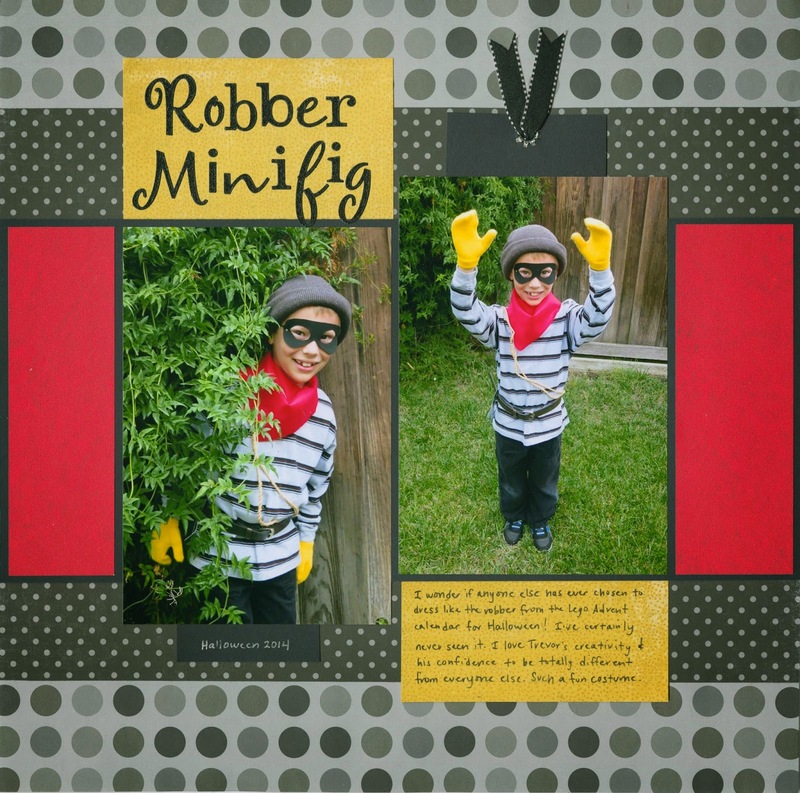 I had so much fun scrapping the pictures of Trevor's 2014 Halloween costume! Rather than use the traditional Halloween colors, I pulled the greys, black, yellow, and red from his costume and worked with those. It was an unusual palette for me and I love how it turned out. I did something on this layout I almost never do, which is add a hidden element. The layout was almost done when I realized that I should include a photo of the actual minifig that inspired the costume. I was happy with my design and didn't want to mess with it too much, so I replaced a planned embellishment with a tag that holds the photo. Since it's near the top and pulls upward, the page shouldn't need to be removed from the page protector to look at the extra photo. I've celebrated (or not celebrated) Valentine's Day in tons of different ways over the years. In fact, I don't think I've ever done the same thing on February 14 in all my 42 years. Some years have been great; others, less so. One of the most memorable Valentine's Day celebrations I've had was when we joined my parents and my sister's family for a cruise to Hawaii over Valentine's Day in 2009. Here we are on 2/14/09 with our entry for the boat-building contest using items scavenged aboard ship. We designed the S.S. Tie Canic, so named because the base of it was empty cans tied together. My contributions included writing the name on the sail, stringing the beads, and cutting faces out of brochures we got from the Future Cruises office to make the portholes. It was a really, really fun day. Of course, most of my Valentine's Day celebrations haven't been nearly as grand as a Hawaii cruise, but that doesn't make them less fun. This year was awesome. We started the day at a roller rink for their Little People session, which is an hour-long lesson for kids 10 and under, then a 2-hour skating session for kids 10 and under and their parents. Between the dim lighting, movement, and disco balls, the pictures we took of each other didn't turn out very well - grainy, blurry, and otherwise lousy. Too bad since we were all smiles! But I did get a photo of our skates that I like. We spent the afternoon making fresh pasta together. It was such a fun way to spend time as a family. Because it was Valentine's Day, we used a heart-shaped cookie cutter to make our ravioli. It was no more difficult than any other shape would have been and it added such a festive touch to dinner. We had chocolate mousse for dessert, also heart-shaped. Next time I make mousse, I'm going line the molds with plastic wrap so that I can remove the hearts intact. Roller skating and cooking together may not be the stereotypical way to spend Valentine's Day, but it was fantastic. I highly recommend it. 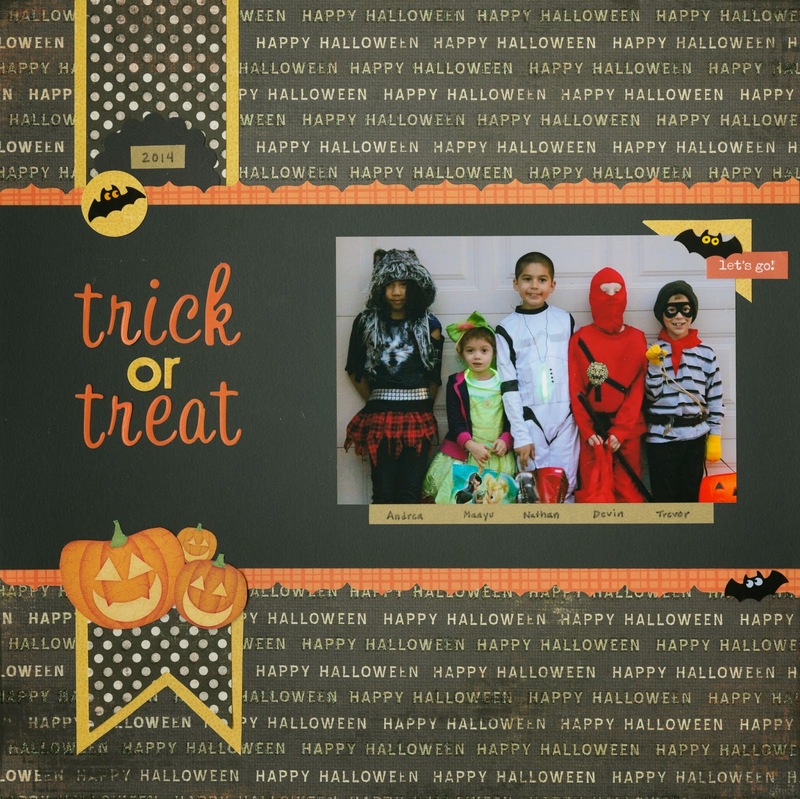 The forecast called for heavy rain and possible thunderstorms on Halloween, but the skies were completely clear when we set out for trick-or-treating and stayed that way all evening. Trevor and his friends had a great time. This year, I didn't even attempt to take photos as the kids knocked on doors or zipped down the street to the next house. Just a decent group shot before it got completely dark and we were good to go. About midway through making his Yoda valentines, Trevor was ready to quit. His hand hurt from coloring and cutting. He was starting to look around for distractions, and his eyes landed on the bag of Twizzlers. We started talking about ways that we could use the Twizzlers for a future craft. By putting our heads together, we came up with this incredibly simple dragonfly. Trevor liked the dragonfly so much that he decided half the class would get Yoda valentines and half would get dragonfly valentines. Use the Sharpie to write the recipient's name and your name on the lines on the printed side of the Twizzler. Flip it over, and draw eyes and a mouth on one end. Punch two hearts from vellum. Arrange them so the tips are touching, then tape them to the Twizzler. So easy! Have I mentioned how much I love Twisteezwire?! (Yes. Twice.) They sent me a bunch more of their wires (thank you!) so I've been playing. With Valentine's Day approaching, I thought it would be fun to make some festive decor. I started with one red Twisteezwire and some clear beads. I cut the wire into thirds and bent each to form a heart, twisting one end around the other to secure it. I threaded three beads on the longer end, then formed a small loop to keep them in place. I repeated those steps to make two more hearts. I took a second piece of red Twisteezwire and used it to form a cursive 'Love.' After some trial and error, I discovered that the easiest way to do that was to write the word on a piece of paper, place the wire on the paper, and guide it into position. I added a bead when I got to the O and then kept going. When the word was complete, I added three beads to each end and held them in place with tiny loops. With the four components done, I used monofilament to hang them together like a mobile. Check it out! The most challenging part of the whole thing was tying the darn monofilament where I wanted it. Other than that, the project was quite easy and definitely kid-friendly. I'm really happy with it. I had a lot of fun scrapping and crafting with my friends last weekend. Despite doing a lot more chatting and eating than crafting, I still managed to finish a few projects. 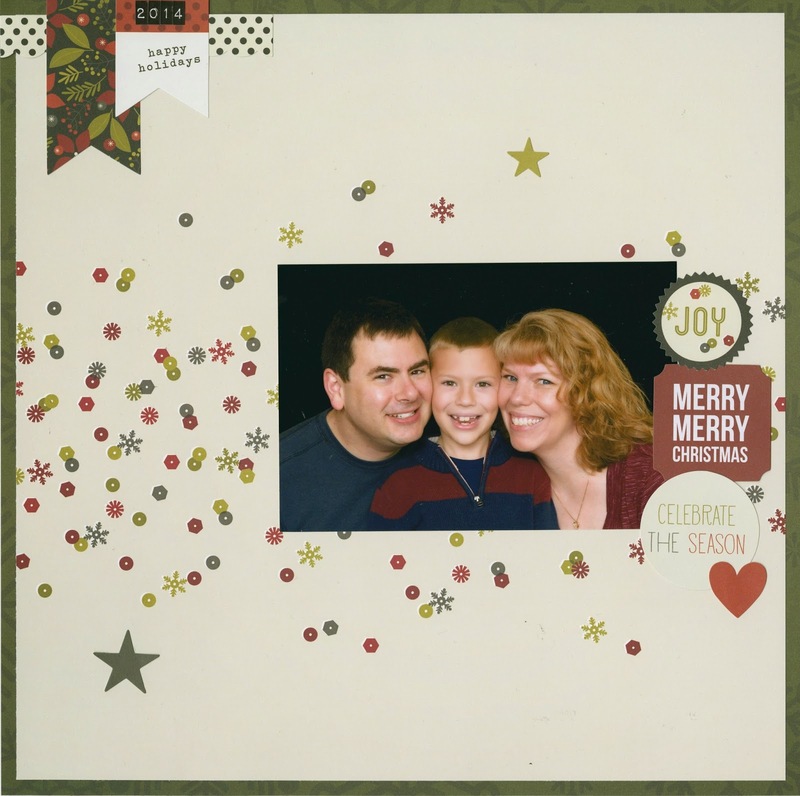 I'm really happy with this layout using our Christmas card photo. It came together so quickly and easily. Love that. I try very, very hard to have creative time each day. It's a priority for me and a big part of staying sane. On a typical weekday, I answer emails and read blogs for an hour or so before Trevor wakes up, work at either or both of my two jobs after dropping him off at school, do errands or chores, work on my own blog, and hopefully squeeze in 15 minutes of creative time before it's time for school pickup. Sometimes Trevor and I get some creative time in together after his homework if he doesn't have an after-school activity or playdate; occasionally, he plays by himself and I can spend some time in the craft room then before dinner. Here's my desk. As you can see, it is a disaster. There are two visible layouts in progress, both two-pagers. I tend to put off two-pagers. There are actually several more layouts in progress (all single pagers) stacked underneath, all in different stages of completion. It's likely some or all of those will get finished before the ones on top. The desk is a disaster because I am doing a major purge. It's time to get rid of all the papers, tools, and other supplies that I don't use and make room for all the goodies I brought home from CHA. This is the floor of the craft room. Believe it or not, those piles have meaning to me. Now that I've gone through them, I just need to put them away in the proper place. I'm hosting a crop tomorrow (yea!) so I got some photos printed. I'm hopeful that I'll have some layouts done and ready to share next week. I suppose it all depends on how much chatting I do and what interesting tools or toys my friends bring for me to play with. Here's yet another pile of stuff on the floor. These are all the business cards and handouts I got at CHA. I'm going through them and putting them into the journal I made at the Mega Block Party. Here is the swag from the Fave Crafts Blogger Event at CHA. I have some ideas sketched out for what I want to submit for the Best Blogger Craft contest; I just need to get started. Hopefully with the old stuff cleared out of the craft room, I'll be able to get going soon. Before I do that though, I'm going to help Trevor finish his valentines. I'm a huge fan of homemade valentines, but I have to admit a small part of me was kind of hoping Trevor would go the purchased route this year. But no. He had a vision of Yoda standing up, holding a green pixie stick lightsaber. I offered to help, because I know from years of experience that making 30 of the same item is very tedious, especially when it's as involved as these valentines. When they're finish, I'll post a tutorial. So there you have it - just some of the items on my creative to-do list! Another layout completed and into the album! This two-pager is about Trevor's first overnight Cub Scout camp. It was harder for me to scrap than usual because I wasn't there. Steve and Trevor came home with tons of pictures and stories, so I knew what the highlights were for them and used those to make the layout. The background started as plain khaki cardstock. I stamped all over both pages with a pine tree stamp and Versamark ink. Before it dried, I swiped brown and green chalks across it to bring out the images. It make a fun, grungy background that was perfect for a camping layout. The strip of green that goes the length of the layout is from BasicGrey's Oh Baby! Boy line, circa 2006. I wouldn't ordinarily think to look in a baby collection for a camping layout, but the scrap was sitting out on my desk, so I decided to use it. The chipboard oars on the top left and the leaves on the bottom right started out black (they're from the Mr. Campy line by Cosmo Cricket). I "painted" them by dipping a finger directly into a bottle of yellowy cream paint, a second finger into green and a third finger in brown. I smeared all the colors onto the black chipboard and let them dry. Then I went back with a brown marker and added grain and shadowing to the oars and veins to the leaves. I really like how it all turned out. For the past few birthdays and Christmases, I've come up with a creative way to give money as a gift to my now-14 year old nephew, Timothy. He's come to expect it, so I have to up my game each time. I think I succeeded with his Christmas gift. If you did not read yesterday's post about cystic fibrosis, please start there. As soon as I learned that Timothy would be traveling to Australia for his Make-a-Wish trip, I knew that I wanted to give him Australian currency for Christmas. I called my bank and ordered Australian currency in small bills. Turns out that the five is the smallest, so I got a big stack of those. My plan was complicated. I bought a huge bag of Wonka candies (which Timothy loves) and immediately ate a bunch of the Nerds (because eating candy is the kind of sacrifice I'm willing to do for him.) I opened up the empty boxes and used them to disguise a cardboard tube. Then I rolled up the money and slid it inside. ... and stuffed the jar with candies. I added the lid, put a bow on top and set it aside. Of course, Timothy was not traveling alone. My sister, brother-in-law and niece were part of the Make-a-Wish trip. My parents paid their own way to tag along. I got Australian currency for Kari, Brian and my parents, put money in ziplock bags for each of them, and prepared containers of Skittles. ... then buried each in the Skittles until they weren't visible. When he removed the joey, he found a tiny note tied around it. The note directed him where to search for an envelope. The envelope instructed him to gather his parents and grandparents before opening it. Here's the assembled group, minus my dad and Steve who were just out of the photo on the left. Brian and Timothy's matching ugly sweaters crack me up. As does Trevor taking a photo over Timothy's shoulder with his new camera. He kept the big one for himself and handed the small ones to his parents (Kari and Brian), Grandma and Grandpa. 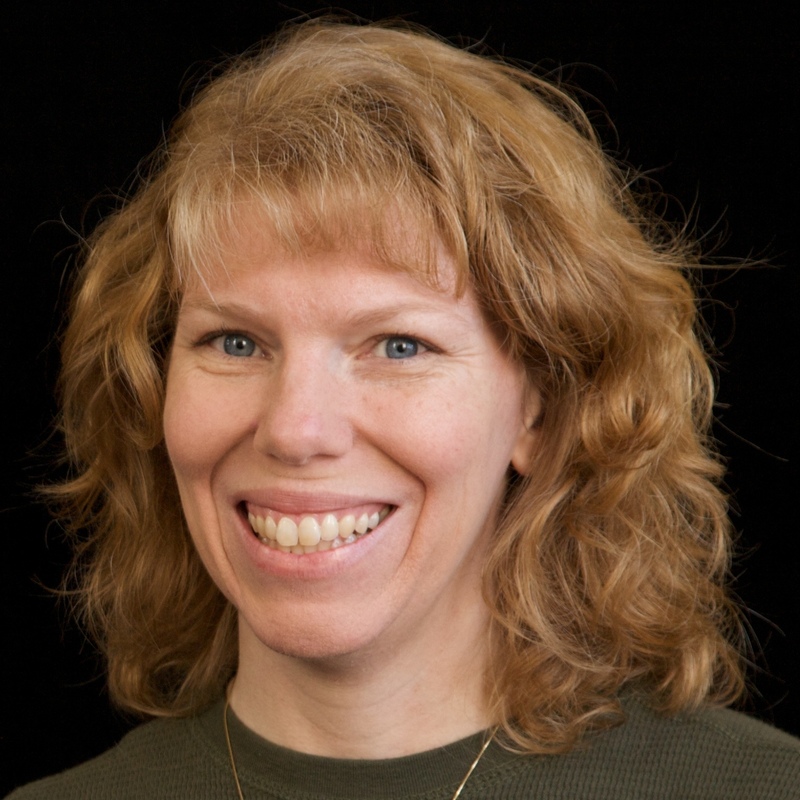 Kari was the most suspicious of the bunch, immediately digging through her Skittles and uncovering the money. Meanwhile, Timothy dumped his candy and found his wad of cash as well. He proclaimed the gift to be "very clever." Success! !